As independent inspector myself I can only point to my experience from a large roadkill of owners who have diabolical problems or dearly wish they had inspections done. It is true that there are over 20,000 builders in Victoria and majority do a decent job and you never hear about them on this forum. However, there is several dozen that frequently pop up with problem builds. There are also many problems with OB jobs. Statistically chances are that you will be Ok but it’s like a tattslotto, chances are low but someone always wins and many win second and third division prizes. Do you want to win a second or third rate build build? No problem, don’t have independent inspections and you will be underwriting your own risk. 1 Builder will know you will have a professional working for you and it will change complexion of things. You won’t be bullied, intimidated and treated like crap. I suspected for a long time that volume builders assign their best supervisors to where they know will be independent inspector. Other jobs get leftovers. But just recently one of the building managers for a large volume builder said so to me. 2 Pre-contract review- your most important inspection. If you willingly sign off on a bad deal no one can help you. 3 Pre Slab inspection- another pair of eyes going over slab preparation, levels, drawings, drainage etc before concrete is poured. 4 Frame inspection, in theory should not be required because building inspector does those for mandatory requirements but often I pickup on serious defects and omissions. 5 Pre plaster-last chance inspection to check everything before everything gets covered up, after that you cannot see and if your plaster has bows and hollows then walls have not been properly straightened.What about fire walls if you are in a unit? 7 having your expert in the cloud should bring you comfort and respect from your builder, otherwise you may be treated as a pushover. From experience, pre contract review plus 4 stage inspections is the sweet point between price and value. I have been looking after people building wwith builders for over a decade now and where I do all five inspections we invariably get to the finish with minimum of fuss. The other thing you need to remember is that finding defects and knowing what to do about them is two different things. There are many inspectors at a lower price, that will write out a list of defects and give you a report but then you are on your own. Expect to pay $ 600-650/inspection depending on house size. Yes you can pay less but you get what you pay for and yes you can skimp on some inspections if you underwrite your own risk. I have many inspection examples on my blogs. “Australia’s most professional builder” is pure bull of course but how many people were misled? So have a critical look at all web sites and look for credibility, how many have set out their claim to experise or is it just marketing bull? How many are offering pre inspection agreement, where they set out what is inspected and what isn’t. Do they say they inspect to AS 4349.0, 4349.1 or 4349.3 , their insurer requires them to. So as a customer you have to do due dilligence in picking your inspector, if you don’t you may pick up a dud one. And expect to pay a fair price. Inspection is a risky business for inspector, if something of significance is missed there goes 5K excess to insurer, so don’t complain about the price. If you are looking for a cheap or discounted inspection don’t complain you are sailing on a cheap boat, better pray it doesn’t get rough. 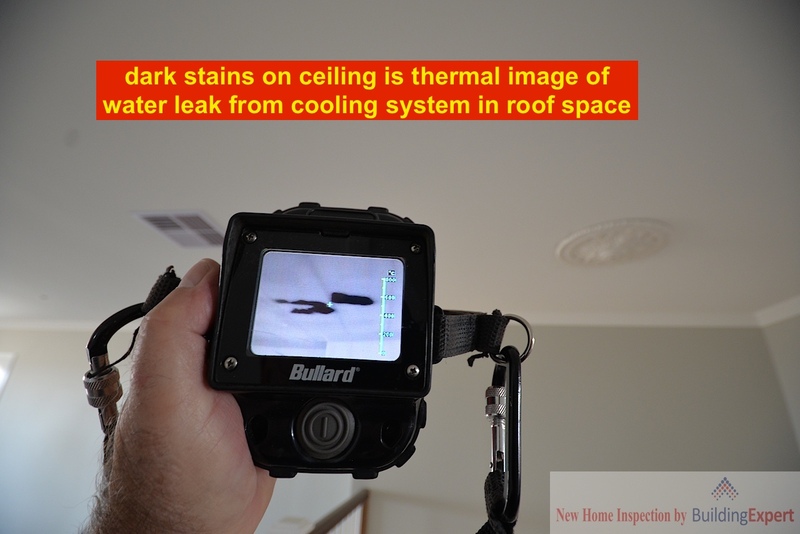 Thermal Imaging Inspection proves its worth, Yet again! This week I did pre final inspection on a large two storey home. As usual I always scan with my thermal imaging camera looking for defects that otherwise would be unseen. 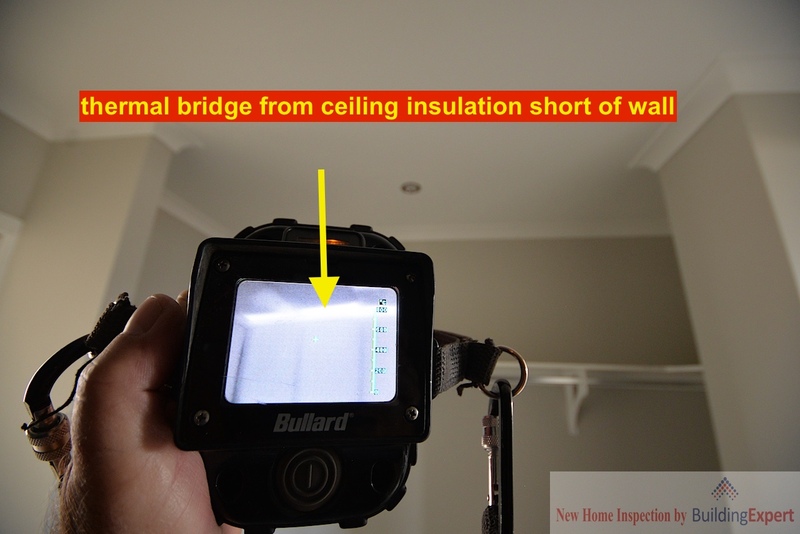 Typically I will find poorly fitted ceiling insulation resulting in thermal bridges. On a hot day heat coming in will be shown as white area on grey background whilst on a cold day it will be dark area (representing heat loss) against a lighter grey background. My clients were suitably impressed and builder’s SS who has not seen TI before was amazed but then thanked me and quickly made arrangements to have the leak fixed. This dwelling was not going to be handed over this year and had they not known about and fixed the leak they might have found ceiling on the floor when they came back to work next year. relevant qualifications, experience, track record, longevity in business, PI insurance + have they invested in the best equpment to give you best inspection? It will quickly weed them out. Remember, if you paid a cheap price, you are sailing on a cheap boat, pray it doesn’t get rough. Even simple dilapidation inspection could turn into a drama! This week I was engaged for dilapidation inspection and report on a older dwelling that was next to major domestic development. Owners wisely decided that the condition of their home should be properly recorded so that if any damage occurs from adjoining developmentthey had evidence for compensation. Dilapidation reports are straightforward and uneventful. It’s an inspection with lots of high resolution photos and a good mental picture in case I have to appear in dispute and give expert evidence. Report simply highlights any significant defects and the remainder of photos are stored on file for reference if required in the future. I have done many dilapidation reports for owners and developers alike, owners for their protection from damage caused by developer’s builders and developers from claims for pre existing damage they did not cause. Usually it is a walk in the park for me but here it turned out to be opening act of a drama. Development site was cleared and fenced off (but without identification as required by regulation) Then I spotted lots of broken asbestos cement sheets on the ground. Even though I did not test the product I knew it originated prior to 1985 when use of Asbestos was banned in building products. To make the matters worse there was a fencing contractor with his two young sons working on site walking among broken Asbestos oblivious to the danger it posed. Owners too had no idea. It seems that developer engaged cowboy demolition contractor to do the job ( the lowest price you see) and with no one checking (developer is too busy planning his profit to care) my clients, workers on site and neighbours were all exposed to dangers of airborne Asbestos dust. I advised my clients to call the councila and WorkSAFE Victoria and report the matter as the site needed to be shut down and properly decontaminated. There was another matter. My clients told me that a three metre deep excavation was to occur for car basement only a metre away from their boundary fence. I asked them if they were served with works protection notices. They weren’t. Ultimately it is relevant building surveyor that decides whether works protection notices are required but I would not necessarily trust their judgment because they can get too close to the builder. I explained to the owners that there had been excavation collapses and that in my opinion the matter deserved a closer look and if building works were to start without notices to contact me for further advice. So there you are, two significant issues have arisen, risk to health and a risk to property. My client is in good hands! Yes there is liability for negligence for any inspection that inspector does. However you have got to remember that if there is significant defect during construction, builder is responsible whether it is discovered or not. So if your inspector misses a significant defect your builder still has to fix it and the measure of damage against inspector is your loss in him not picking it up earlier. Perhaps proper value of loss is refund of inspection fee but every case is different. Lot of people misunderstand the nature of PI. It is not insurance against everything, its against negligence. So if your inspector performed dilligent inspection but something is hidden from him its not negligence. If he should have looked under sub floor but did not its negligence. Similarly if your inspector has given you a considered advice he may not be negligent if the advice turns out to be wrong or if it turns out that it could have been better. If you want a cheap inspection dont complain you are sailing on a cheap boat.